This website is to provide information about maiko of Kyoto, Japan, to non-Japanese overseas. 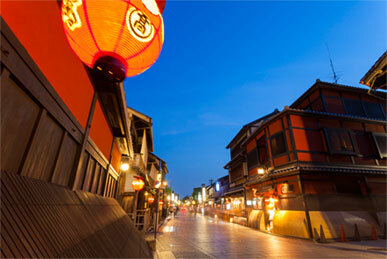 There are 5 entertainment streets in Kyoto city. They are called “Gokagai” and include Kamishichiken, Gion Kobu, Gion Higashi, Ponto cho and Miyagawa cho. Each street has a coat of arms, which is drawn at the bottom of Maiko's hanging belt. This is to recognize to which family a Maiko belongs, wherever she may be. It's located a little far away from the other four streets, but it's known as the most historical and oldest street of the Gokagai area. Kamishichiken started when seven teahouses were built in this place out of timbers remaining after repairs to Kitano Tenmangu shrine, which was burned in a fire during the Muromachi Period. At that time, it was called Shichigen Chaya (seven tea houses). Since then, this street has prospered, because it was built right in front of the gate to Kitano Tenmangu shrine. Its coat of arms consists of Taiko Hideyoshi's favorite “Five Dumplings.” When Taiko Hideyoshi held Kitano Grand Tea Party, he was offered the famous mitarashi dumplings. He loved them so much that he gave the special right to do business in them and the share of the tea house for the religious celemonies. This story is the basis for the “Five Dumplings” coat of arms, they say. It's the largest street that has prospered as tea house located in a busy area with many visitors. It's right in front of the gate to Yasaka Shrine. It's the most widely known street of its kind, due to it being used in the literature or as a stage for kabuki. When they talk about entertainment streets, many people image Gion. Its coat of arms is linked to the 8 small towns in the street and contains the “甲” character in the center of 8 dumplings arranged in a circle shape. Until the 4th year of the Kaei era, they used a white “祇” character in 8 “dumplings arranged in a circle shape”, but changed it to “甲” when, during the Meiji period, they got split into 甲 and 乙. They kept it until now. 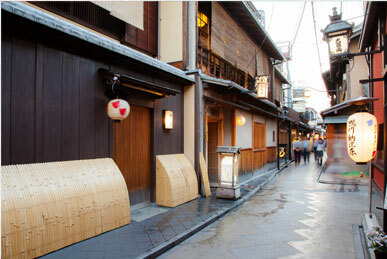 This street has prospered together with Gion Kobu, because it's located in front of the gate to the Yasaka Shrine. This street is relatively small among the Gokagai, with the smallest number of Maiko. 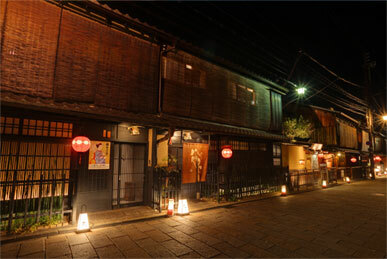 However, after the Gion Kagetsu theater was built, it became a street that nicely mixes history and modern times. 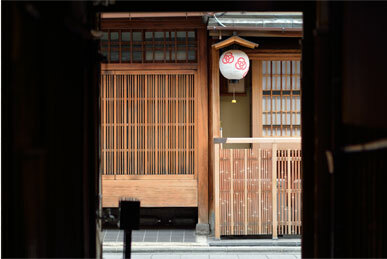 It's said that in the late Edo Period, this street had up to 500 teahouses and more than 1000 Geiko, Maiko, prostitutes altogether, and that it was loved by literary men, politicians and so on. Its coat of arms is a “dumplings arranged in a circle shape”, the same as Kobu, but there is no character inside the circle. This street is located in a very narrow passage along Kamogawa River. The unique name of this street is said come from “Ponto”, meaning “edge”, in Portuguese. The street has prospered because the inns and teahouses here naturally started to serve passengers of the Takase boats traveling up and down the Takase River. Kamogawa Dance also started in this place. Its coat of arms is a lovely “Chidorimon” (meaning “a plover bird”), one of the winter attractions around Kamogawa River. It matches perfectly with the poetic and sentimental image of the Kyoto's entertainment streets. This street is said to be linked deeply with the theatrical entertainment, and it prospered because of it. Beginning with the house of Izumo Okuni famous for its Kabuki performance, there are a number of theatrical houses in this street. They say that these houses with their performers and their staff and the audiences who came to watch the performances, required a greater number of accommodations. That created the foundation of this street. Its coat of arms is “Mitsuwa” (“Three Rings”). There are a few stories about this design. One story is that it celebrates an educational facility built among Shrines and Temples, Street Houses, and Entertainment Street. Another story is that it symbolizes three miniature shrines based on the old tale of Miyagawa. Yet another story is that it's a good word rhyming with “Miya” of Miyagawa. It came into use since the Meiji Period, and it's believed to symbolize three miniature shrines based on the old tale of Miyagawa. Copyright (C) EVERESTRY Ltd. All Rights Reserved.